With only 9 players, the Eagles went out and got the victory last night. While the Coach wanted to forfeit, the Kids said No…. Emmie Vines scored 4 and Shelly Renegar scored 3 for the Eagles. UPDATE – I’ve gotten some private feedback that demands some clarification. Let me say I’m an Eagles fan, I love the fact that the Coach was concerned a player might get hurt playing short-handed BUT was also prepared to support the players choice to play. That’s the kind of team I want to be on! The Vikings got goals from Shelbie Stewart (2), M. Robb, Jessica Maerz (3) and Kelsey Loderhose (2). K Freeman scored for the Hornets. The Eagles win in this late season game points to their traditional ability to peak during Districts. Joplin’s Kelsey Sanders scored first with about 17 1/2 minutes left in the first half. Lebanon tied it up about 3 minutes later (#6 Hannah Winkle). With less than 5 minutes left in the first half, Joplin’s Autumn Lewis scored off of a Lauren Copple corner kick to put Joplin ahead 2 to 1 at the half. Lebanon’s # 5 Emily Boyer tied it up again with just over 9 minutes left in the second half. Both overtime periods were scoreless sending the game into PKs. Sorry, I did not note which Lebanon’s players made their PKs. Joplin’s Kelsey Sanders made the first PK. Lebanon scored. Joplin’s second shot went high. Lebanon’s second shot was blocked by Joplin’s goalie. 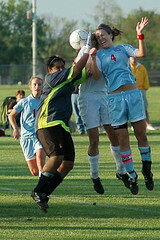 Joplin’s Katelyn Miller scored. Lebanon’s third shooter scored. Joplin’s Autumn Lewis scored. Lebanon’s fourth shot was blocked by the goalie. 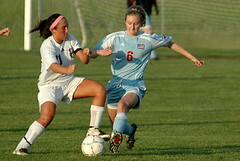 Joplin’s Stephanie Loden scored to give Joplin the win with a 4 to 3 PK advantage. Kickapoo’s Megan Melugin scored all three goals for Kickapoo including one 10 minutes in the first half giving Kickapoo a 1-0 lead through the half. Two minutes into the second half, Camdenton’s Haley Baker scored off a cross tying the score at 1 each. Kickapoo scored twice more and led 3-1 until 13 minutes left in the match when Camdenton’s Stephanie Kirvan scored a goal making it 3-2. Kickapoo outshot Camdenton in a contest that was physical and fun to watch. A battle for the inaugural Central Ozark Conference large school title this season goes to the Tigers who got the game winner from senior Eva Schwert who’s original shot was blocked by goalie Kristin Miller. The rebound fell to Schwert however who buried her second opportunity. The Fightin’ Irish earn the COC small school title with their win. Catholic gets two goals from Natalie Smid and two from Bekah Bade. Jonna Welch scored for the Liberators with an amazing 24 yard blast. 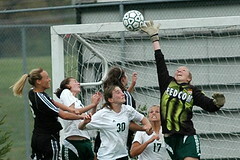 Catholic goalkeeper Rachel Scott was issued a red card in the 12th minute for handling the ball outside the penalty area. Willard jumped out to a 1-0 lead minutes before the end of the first half, but the Lady Tigers were able to tie it up with less than 10 minutes left in regulation when Patricia Marin, off an assist from Jessica Diaz, found the back of the net. Scoreless overtime led to PK’s, won by Willard. Story in the Carthage Press. Neosho gets goals from Jackie Field, Melanie White and Shelby. Neva Raschel scored for Branson. Neosho is now 10-7 this season, 3-2 in the COC and will soon be focusing on getting past Joplin for a District title. A late season upset for the Wildcats, knocking off their Webster-county rivals. As befits a goalkeeper, she pointed to junior Jessica Maerz in the midfield and sophomore McKenzi Payton who will anchor the defense. For scoring, the Vikings will call on on jr. Shelby Stewart, probably the fastest forward in the region, and so. Kelsey Loderhose to help the Vikings compete offensively. It’s a solid core with the ability to score which will be necessary in the difficult District 11 lineup. Things were winding down Wednesday when I stopped by but you can see an example of Caylin’s ability, and Jess Maerz, in this short clip. It was an offensive battle at the Irish field Tuesday evening with all of the goals, save one, scored in the first half. Catholic’s dynamic freshman forward Shelby Hatz, assisted by Rachel Herron, gave the home team their only advantage on the evening in the 7th minute. Katie Pritchard, assisted by Erica Combs, tied the game after hitting the upright twice prior. In the final 15 minutes of the half, Natascha Lord scored when she buried her second chance, after Rachel Scott some how parried her initial blast. Carsen Baron, working hard on the right side, made the needed run to be in position at the far post when Hatz put a square ball across the face of the goal. Pritchard got the game winner in stoppage time however when she won a 50/50 ball outside the box. Her quick shot slipped inside the near upright and Tigers went to half time with the lead. The second half saw Catholic put significant pressure on the Tigers, with the best opportunity coming in the 65th minute, only to see Crystal Hutchinson get her fingers on the shot from the right side, tipping the ball up and off the crossbar. The Tigers put the game away on a late corner kick, Lord putting one of her fine balls to the far post where midfielder Erica Combs rose to meet it (pictured). The Irish got within one in stoppage time when Natalie Smid put away the rebound of a shot deflected by Hutchinson on Maddy Renner’s cross. Renner was tireless Tuesday night, making run after run into the offensive end from her midfield position, with balls from Parker, Bailes, Smid and her sister Ronnie offering a regular attacking option. Congratulations to Katie Pritchard on setting the Class 2 state record with her 168th and 169th career goals. Photo Slideshow from the game Photos will follow tomorrow afternoon, I’ve got a business meeting in the morning I’m still preparing for. Falcon’s get goals from Lorin Opfer, Katie Brewer, Emily Jordan, Jeni Frewin and Emily Cline. Megan Manzer scored for Camdenton. Freshman Jonna Welch scored a goal in each half for the Liberators. Shelby Stewart got a pair for the Vikings, one in each half, bracketing Rachel Lazenby’s goal for Joplin. Stewart’s game winner came in OT. The Tigers got their x shutout of the season on the strength of goals by Alicia Collard and Megan Gunnels. Olivia Cox and Ellen Spooner combined to give the Bulldogs their 4th straight Conference win. Cox scored the game-winner in the 4th minute from Spooner’s assist and returned the favor in the 11th when Spooner scored for the final margin. 10 minutes into the 2nd half the game was called due to weather conditions. Adrian Pogue recorded her 8th shutout of the season. The Bulldogs move to 6-2 in the Ozark Conference.